This lesson gives instructions for one of the simplest and most popular designs for a homemade motor. It can be used as an in-class demonstration, or a hands-on activity for students, or a take-home kit. In any of these modes, it offers a wonderful introduction to the working principles behind an electric motor. A lecture slide is attached to help explain the operation of this motor, but younger students do not need to acquire a deep understanding of the underlying principles in order to have a good time with this device. This lesson describes the construction and operation of the electric screw motor. For basic principles of operation describing how this and other motors work, please see our lesson on A Survey of Simple Electric Motors. For other simple motor designs, see our lesson on Minimalist Motors. The motor described in this lesson has become one of the most popular homemade models around. Demonstration of "the world's simplest motor" by Steve Spangler. There are many demonstrations of this motor available, but my favorite is one given by Steve Spangler on a Denver news station (see the video above). Mr. Spangler's brilliant innovation (no pun intended) was to add LED lights to make it easier to see the motor rotate. The dimensions of the magnet are not critical, but if you are using the LEDs, it's convenient to choose a magnet diameter at least as big as the battery — 2cm (3/4 inch) or larger. It is also convenient to choose a magnet height of at least 5mm (1/4 inch) in order to make the electrical connection to the side of the magnet. A stack of thinner magnets will also work. WARNING: Neodymium magnets are very strong and must be kept away from electronics chips and credit cards. They are also brittle and can shatter when dropped. Disk batteries typically come in two different types. The smaller diameter batteries (5 to 10mm) called "button cell batteries" supply 1.5 volts, and the larger diameter batteries (roughly 2cm) called "coin batteries" supply 3 volts. Most common LEDs require a power supply of 2 to 5 volts; look for the "typical forward supply voltage" indicated on the package. A battery supplying 1.5 volts is usually not able to light the LED. In this case, use the 3 volt battery instead. WARNING: pay attention to the "maximum forward supply" voltage! Some LED's will burn out if connected to a 3 volt source. Fig. 1: The electric screw motor with magnetic field lines drawn around the disk magnet. Electrons travel from the negative side of the battery, through the wire, through the disk magnet to the center, and up the screw. As the electrons travel from the edge of the magnet to the center, the Lorentz force is directed into the page, causing the magnet to turn. Fig. 2: An electric power meter, which operates off the same design principles as the electric screw motor. Connect the wire from the top of the battery to the edge of the magnet and watch it go. The force that powers this motor comes from the interaction between the electric current in the circuit, and the magnetic field supplied by the neodymium magnet. As discovered by Hans Christien Ørsted in 1821, an electric current produces a magnetic field. In this demonstration, the magnetic field produced by the current feels a force from the magnetic field of the neodymium magnet, which causes the motor to spin. This force is an example of a "Lorentz force" which describes the force exerted by a magnet on an electric current. In figure 1, electrons travel from the negative side of the battery, through the wire and the magnet, and up the screw. As the electrons in the wire approach the center of the magnet, the Lorentz force they feel is directed out of the page. The corresponding force exerted on the near edge of the magnet is into the page (the magnet and the wire are pushing on each other in opposite directions), so that the magnet turns in the clockwise direction as viewed from above. 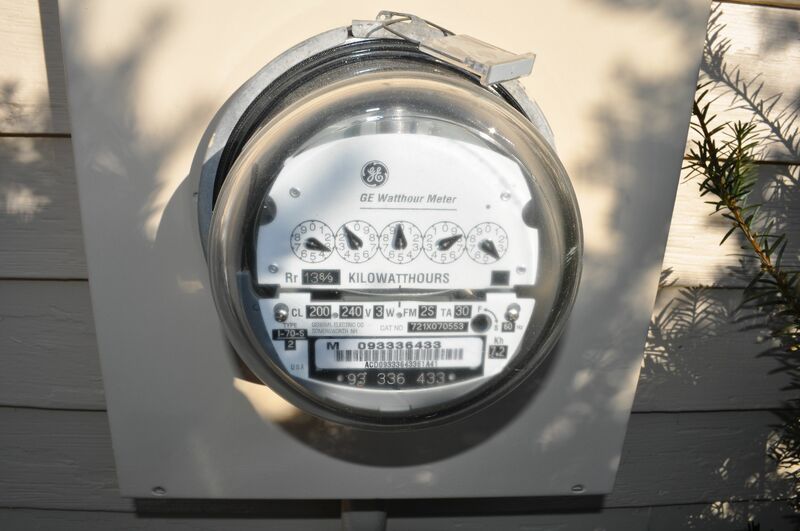 An electricity meter that measures the energy usage in your home (figure 2) is said to work on the same principles. The metal disk that turns the gauges is essentially an electric motor that only rotates when power is delivered to your house. Since the meter must register alternating current, it is presumably designed with electromagnets that reverse the field direction every time the current reverses. That way, the field surrounding the rotor and the current through the rotor both reverse at the same time, and the motor always turns in the same direction (see the discussion below in "questions to ponder"). If your motor is not turning, make sure you are holding one end of the wire firmly to the top of the battery, and the other end gently brushing the outside edge of the magnet. The magnet or the battery might need cleaning with alcohol if either has been handled a lot. Oils from your hands can prevent the connection from being made. Also make sure your screw conducts electricity. Some screws are coated with an insulating material to prevent corrosion. If you connect the wire to the center of the magnet instead of the edge of the magnet, the motor won't turn as well. In this case, the force on the magnet delivers a smaller torque; it has less leverage close to the axle than it does far from the axle. Make sure you connect to the very edge of the magnet. If your LED is not lighting up, the most likey reason is that it is connected the wrong way around. LED's only light if the current is flowing in one particular direction. Try turning the disk battery upside down and reconnecting the LED. It's possible to burn out an LED by supplying too much voltage or current. If your LED flashes brilliantly once, and then never lights again, or if it turns brown and starts smoking, you've gone too far. Read the LED package label to look for the "maximum forward supply" voltage before making the connection. What happens if we turn the magnet over or turn the battery upside down? Naturally, if we turn the magnet over, we reverse the direction of the magnetic field lines. If we turn the battery over, we reverse the direction of current flow. In either case, we reverse the direction of the Lorentz forces. The motor will run backwards. Lorentz described the force of the magnet on the electrons flowing in the wire, and that might explain why the wire moves (if we didn't hold it still), but what force makes the magnet move? Forces always come in pairs. Newton codified this principle as his third law of motion, roughly summarized as: "for every action there is an equal and opposite reaction". The interaction between the magnet and the wire is an example of this principle. The magnet and the wire are pushing against each other. As the magnet pushes on the wire, it recoils because the wire is pushing on the magnet with equal strength in the opposite direction. In this sense, the Lorentz force is a description of two forces: the force on the moving electrons in the wire, and the recoil force on the magnet. Discussing the detailed operation of the electric screw motor works best after students have seen and understood electromagnets and can appreciate the interaction between a magnet and a current in a wire. Check out Basic Electromagnets for some ideas. Classroom Rail Gun also demonstrates the Lorentz force in a very simple way that helps prepare students to understand the role of the Lorentz force in this lesson. The electric screw motor works well as a demonstration for small groups of students, but it can also be used as a take-away kit that students play with by themselves. When bought in bulk, the materials can cost as little as a dollar or two per motor, making it possible to outfit an entire class at relatively low cost. If you can afford to let the students take the kit home to keep, it will be a lesson they will never forget. WARNING: Neodymium magnets are very strong and must be kept away from electronics chips and credit cards. They are also brittle and can shatter when dropped. 1. Lorentz, Hendrik Antoon (1892), "La Théorie electromagnétique de Maxwell et son application aux corps mouvants at the Internet Archive", Archives néerlandaises des sciences exactes et naturelles 25: 363–552.